Huawei is the rising star of the smartphone market: a company that has witnessed booming growth in the past couple of years, it now stands right behind Apple in terms of the number of phones it sells and could likely overtake it soon. The next target is Samsung. To achieve such high goals, Huawei has a few aces up its sleeve: it's got its large-phone Mate series that stand out with their great battery life, then there is the P series of flagship devices that now carry a dual-camera system made in partnership with Leica. Now, Huawei also introduces something for those looking for a more affordable phone: the mid-range Nova series. Rather than focus on processors and the technical side, Huawei focused on two key features of the new Huawei Nova: its outstanding camera, including some new selfie tricks, and its improved battery life. First, the improvements in battery life seem to come from two places: obviously, a very large, 3,020 mAh battery, and a more efficient processor. The breakthrough for Huawei here is called a high-density stacking architecture, a new layout that allows 20% more space for the battery, so that the cell of the Nova is nearly twice as big as that on the iPhone 6s. Then, there is the new USB Type-C port that's a nice little thing to have, so that you don't need to wonder which is the right way to plug a cable to charge your phone. 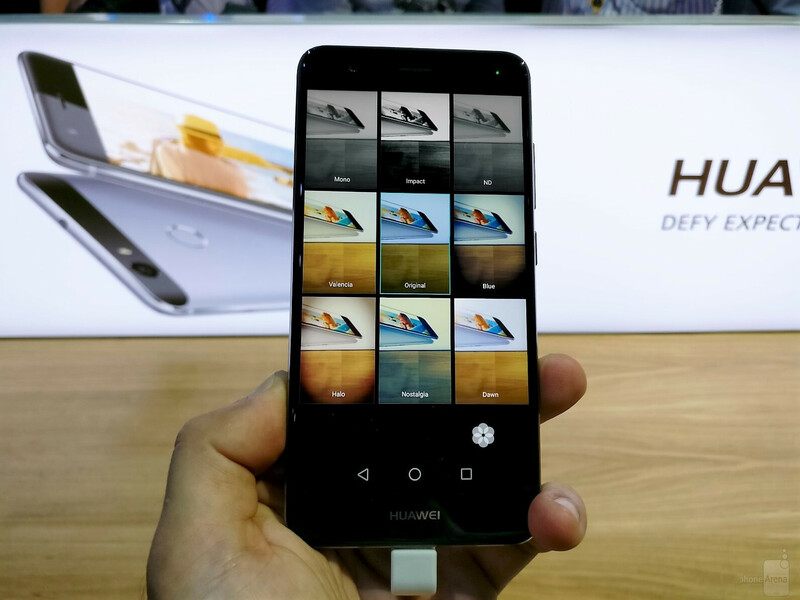 Huawei advertizes the Nova as a lifestyle device, and that requires a great camera. 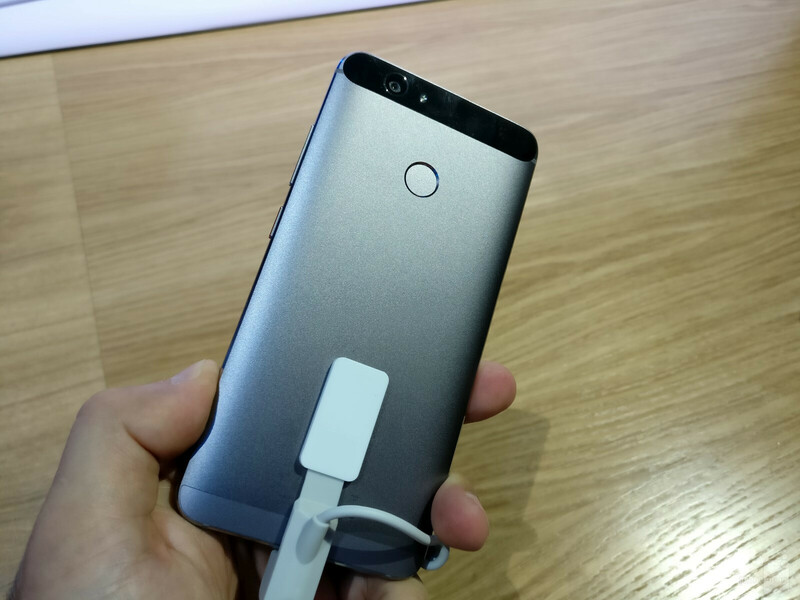 While at first sight the Huawei Nova does not have a camera that could match flagship smartphones, or even the excellent OnePlus 3, it seems to offer decent performance. The Huawei Nova sports a 12-megapixe camera with 1.25-micron pixels and a 6-piece lens that brags about its low-light capabilities and fast, 0.3-second auto-focus thanks to phase detection tech. We're glad to see support for 4K video recording as well. The Huawei Nova has a 'selfie-optimized' 8-megapixel camera that aims to provide 'perfectly lit selfies in low-light' thanks to a selfie screen flash. It also features an optimized beauty algorithm that aims to provide natural-looking skin tones. A gimmick that girls will probably like is a Beauty Makeup tool that shows you what your face would look like with 8 different types of make-up and lipstick. The Nova ships with a fingerprint on its back, but it's not just any fingerprint scanner: Huawei calls this a level 4 fingerprint reader. This is to indicate the difference with level 3 fingerprint scanners found on even flagship phones these days. A level 4 finger scanner like the one on the Nova features 3D fingerprint recognition, looking in depth and featuring self-learning algorithms and FIDO certification. Put simply, unlike other phones, this new fingerprint scanner is protected from fingerprint fraud. If you try, you could copy a fingerprint that someone has left somewhere and then use this copy to unlock a level 3 fingerprint phone, but the depth reading on the Huawei Nova prevents such type of fraud. Neat! 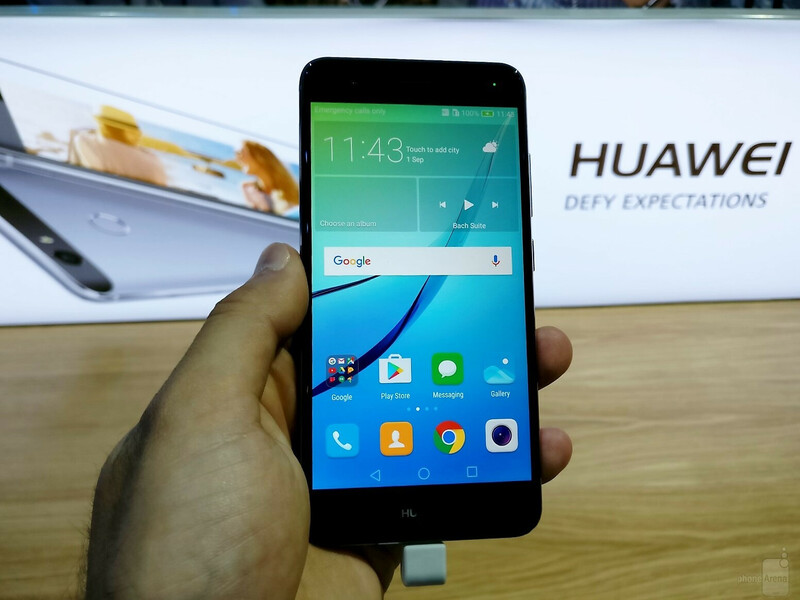 The familiar Huawei Emotion UI is a pretty deep overhaul of the standard Android look. Gone is the app drawer, and gone are a lot of the familiar visual touches, even the icons seem completely changed. Yet, what's good is that this otherwise heavy skin in terms of changes, feels very light and fluid in terms of performance. Our initial impressions are very positive, this is one smooth daily performance. The list of special new features for the Huawei Nova includes a new eye protection mode that filters out blue light to 50% less, and automatically adjusts brightness and color temperature, so that you can safely use your phone at night. There is also a long, vertical screenshot that you can capture via a special gesture and using two knuckles you can easily precisely crop parts of images. A neat new option allows you to straighten pictures of documents that you might have taken. The rest is really little details that Huawei has paid attention to: the ergonomic curve, the 2.5D screen, the compact screen-to-body ratio of 76% that makes the 5" Nova almost as compact as the 4.7" iPhone 6s. Also, the impressive 1.8mm narrow bezel: compare this with 3.07mm on the Galaxy S7 and 4.29mm on the iPhone 6s. Huawei also takes pride in its display with vivid colors, and the company bragged about 'orange that looks orange' on this screen. The phone is also well equipped in terms of connectivity: there is 7 4G LTE bands covering all of Europe (we're yet to hear about US version with relevant bands). 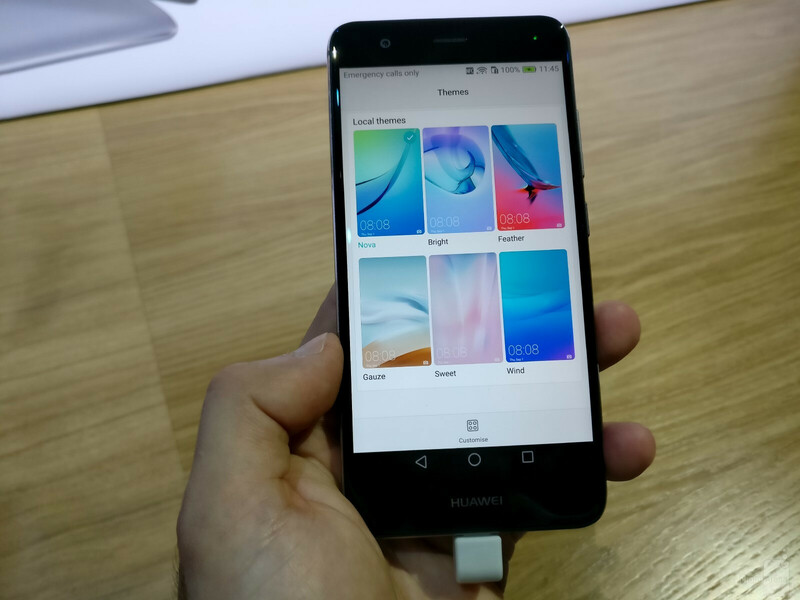 Huawei also claims this new phone has the fastest network search while roaming. At the end of the day, there is a reason why Huawei is being so successful both globally and at its home in China: the combination of very smooth, fluid performance of its user interface, the exquisite design, the excellent battery life and good camera quality are alluring. At first sight, the Huawei Nova seems to bring these things at a mid-range price of €400 that is quite competitive. Sure, the Huawei Nova has a few fun gimmicks like the make-up mode for selfies, but it still seems like a well-polished smartphone that is focused on getting the important things right. These days, it will meet fierce competition from the likes of the OnePlus 3 that still brings much more to the table at the same price, but you cannot get the OnePlus 3 at carriers or in physical retail stores, nor can you go to a store and get it serviced that easily, and that is something that is valuable to users. If you count this advantage in, the Huawei Nova looks very promising and indeed a fair value for the money. The phone is coming in a choice of titanium gray, mystic silver, prestige gold, and rose gold in October 2016. Those were my thoughts exactly. Will it come to the US? Probably not. If it does though, I'm sure the price of the device will get down to something more along the lines of $300 in six months. At that price, it would be a good buy. I like the fact that they made a 5" device with a 3020 mah battery. Pretty impressive. I agree with you. We will see, and yeah that battery size is awesome! "the Huawei Nova seems to bring these at a midrange price of €400 that is quite competitive" WTF Victor H? Four hundred euros for a Snapdragon 625 and 1080p phone is competitive? I'm better off with a Galaxy Note 4, especially the Exynos variant with four Cortex-A57 cores and four A53s, rather than this Huawei Nova with the SD625 and a bunch of weak cores. I think all major OEMs went full retard this year,offering SD625,mid-range phone for 400€ and up. "Also, the impressive 1.8mm narrow bezel": compare this with 3.07mm on the Galaxy S7 and 4.29mm on the iPhone 6s. =>> There is no way in hell this is true information (about that impressive 1.8mm narrow bezel). Remember that a 5' panel is about 6.23cm in width. This phone has a width of 6.91cm. A simple math provides us 3.4mm bezel for this phone C'mon Huwei! We're not idiots and you're a vicious liar! Like the phone but hell no,will not pay £369 for it!Noooo way!£200 yes! Isn't this what PA was saying was the Next gen Nexus hahah! Stupid!